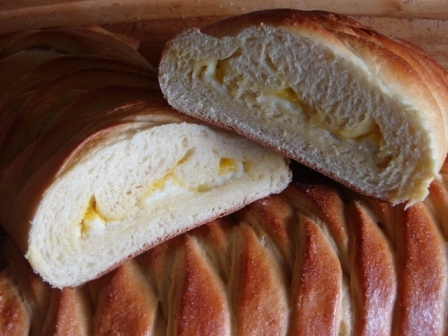 This bread is just slightly sweet, tart, creamy, and surprisingly easy (for a homemade-lemon-curd filled braided loaf). I follow another blog, Smitten Kitchen, and this recipe was posted there a while ago. The best way I can describe this recipe in “non-bakers” terms, is: a (beautiful) rolled up cheese danish with lemon filling. When I found this recipe, one of my first thoughts was “no way am I going to try to make my own lemon curd”. But then, I also didn’t care to run to the store to buy an overpriced jar, so I gave it a shot. I had no clue how easy lemon curd is! If you’re inclined to make your own, the recipe’s in this post. I’d suggest making the lemon curd right before you start the sponge, so it has time to cool down before you need it. I didn’t change much from the recipe that she posted online, but I did double it so we’d have enough for my entire family and some friends. Mix all ingredients and place in a covered bowl. Let sit for 10-15 minutes, until “squishy” and really bubbly. Mix all ingredients (except for lemon curd) and beat/stir until very smooth. Set aside until the dough’s ready for it. (This curd recipe makes just under 1/2 cup, so I used generous portions of each ingredient to get the 1/2 cup the bread recipe calls for). To make dough: Mix all dough ingredients except flour until well combined, then add flour and stir/knead until you have a smooth, silky dough (~5 minutes). Place in a lightly oiled bowl, cover with plastic wrap, and let rise for 1-1.5 hours, until it’s “poofy” and almost doubled. Gently press the air out of the risen dough and divide into two equal parts. Set one aside while you work with the first. Roll the dough out into a rectangle, about 10″ x 15″ (I was surprised at how thin I needed to roll the dough to get it this size. Don’t worry!) At this point, you’ll want to move the rectangle to a piece of parchment paper, since it’s easier to move it now than after it’s filled with a gooey mixture. For the next step, you need to mentally “divide” the rectangle into three long columns (each 3.333…” wide :). You can either eyeball it, or gently press lines lengthwise in the dough to make it easier. Spread half of the cream cheese mixture down the middle of the dough, and top that with half of the lemon curd. 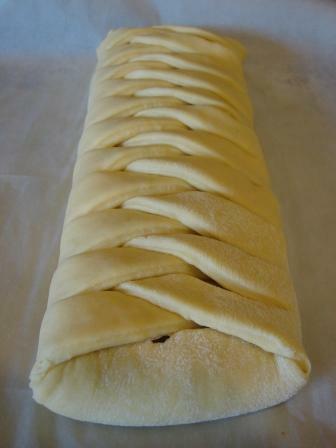 Leave about 2″ empty on either end so it doesn’t ooze everywhere as you fold and braid the dough. Now take a knife or bench scraper (I had no idea that was the name of this tool; we’ve always called it “that thing to scrape dry dough off the cutting board”) and cut 1″ strips all the way down the two side columns. Make sure you have an equal number of strips on the right and left. At this point, I think it looks like a funny centipede (you might want to visualize something that’s not a bug, though). Slice off the 4 corner pieces and fold the top and bottom pieces (those 2″ that didn’t get filling spread on them) over the filling. Then, alternating between left and right, pull the strips diagonally down over the filling. You don’t want to stretch them too much, but make sure the filling is almost completely covered. 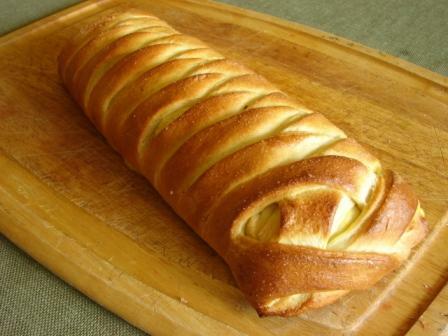 The bottom pieces can be crossed and tucked under the end of the loaf (check out the picture below to see what I mean). Repeat with the second piece of dough. and brush over the loaves. This’ll give them that nice golden color. Sprinkle with coarse sugar (I didn’t have any, so just used regular granulated…not as pretty but it worked). Bake in a 375 degree oven for 25-30 minutes, until nicely golden. Let cool at least half an hour before slicing open. Tags: baking, bread, dessert, recipe, vegetarian. Bookmark the permalink. Want to receive posts directly to your own Little House? I'll stop by via e-mail 2-3 times a week! I’m a coffee purist, until pumpkin spice season.